A precision crimp tool enables termination of contacts from #12 to #22D for D38999 connectors. 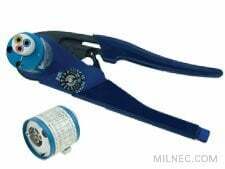 Our tools feature an eight impression crimp, which ensures maximum tensile strength between wire and contact. The cycle controlled ratchet is consistent and accurate and does not permit half crimps, ensuring complete and precise crimping every time.See the contact specific table for the correctly sized tool.